First, a warning: this post is likely be a contender for "most visually uninspiring". But I'll be quick to justify it by pointing out it's all about anticipation and relief - anticipation of lush foliage and flowers this summer, and relief that plants I was sure had not survived winter have come through after all. 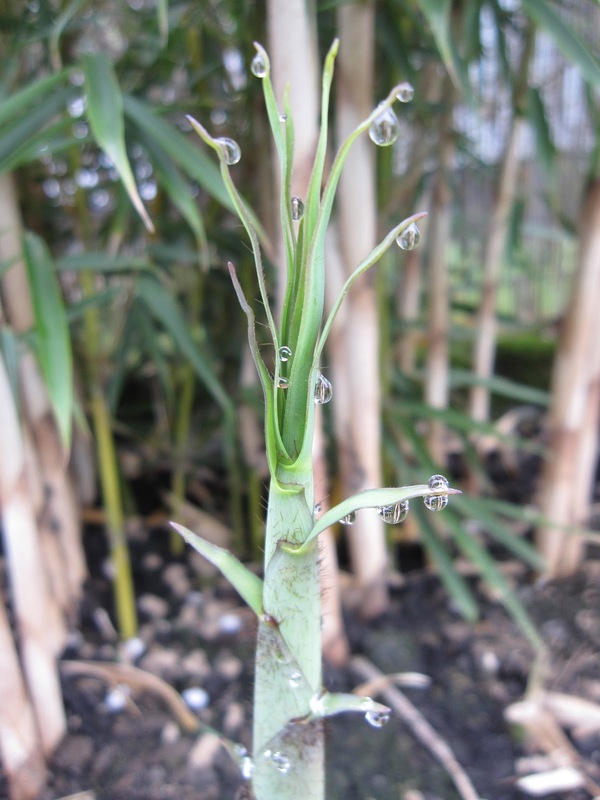 The Fargesia robusta clumps are in their second spring, and each plant is sending up as many new shoots as there are existing canes. See all the new white culms in the background? We'll enjoy a bit more privacy from it this year, for sure. Amazingly, Eucomis pallidiflora ssp. pole-evansii is still alive and returning after being stepped all over by visiting dogs. This is very exciting, people! 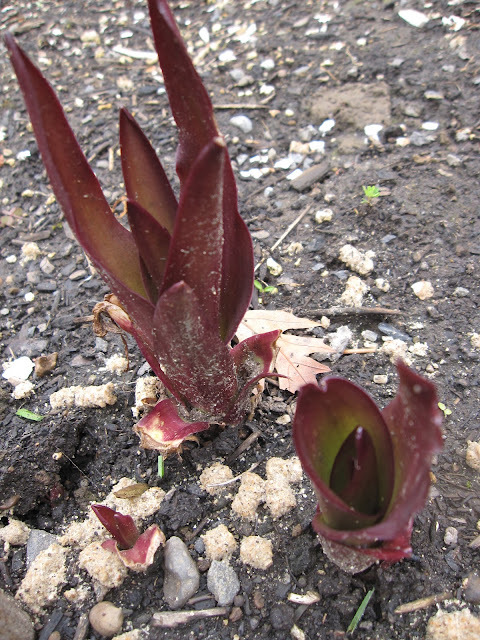 The Eucomis comosa 'Sparkling Burgundy' plants are up and going for it. Maybe they'll even bloom this year. I love the fat terminal buds and perky little leaves on Calistemmon viridiflorus. This will be its third year in the ground...are flowers in my future this summer? 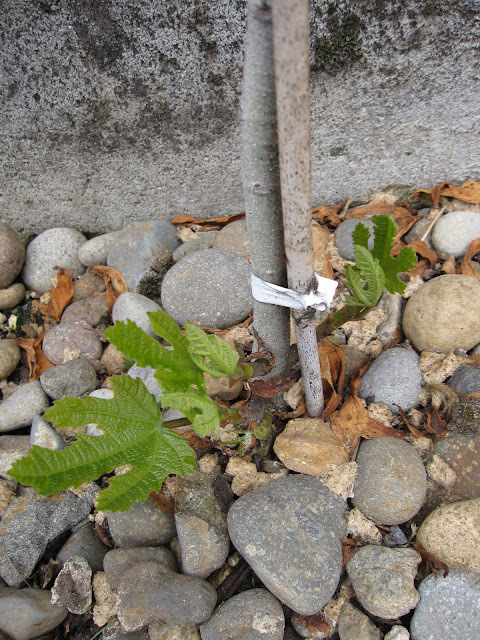 I should know better than to think our winter would do in a fig. Still, it was a sweet relief to see new leaves on my very small Ficus 'Violette de Bordeaux". 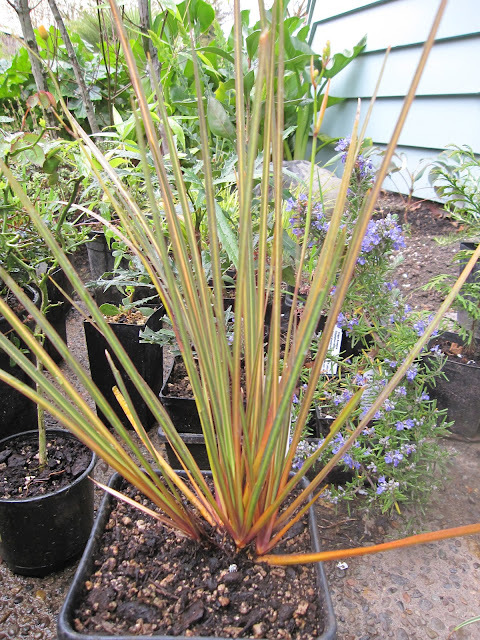 Last, after going into the ground last summer, my beloved Hesperaloe parviflora must have settled too low during winter: all the leaves rotted off at the ground and I was sure I had killed it. But look beside the nasty stump: a new shoot! Foliage Follow-Up is hosted by Pam at Digging on the 16th of each month (I'm a day late.) Click on the link to enjoy some actual foliage for beautiful April inspiration. 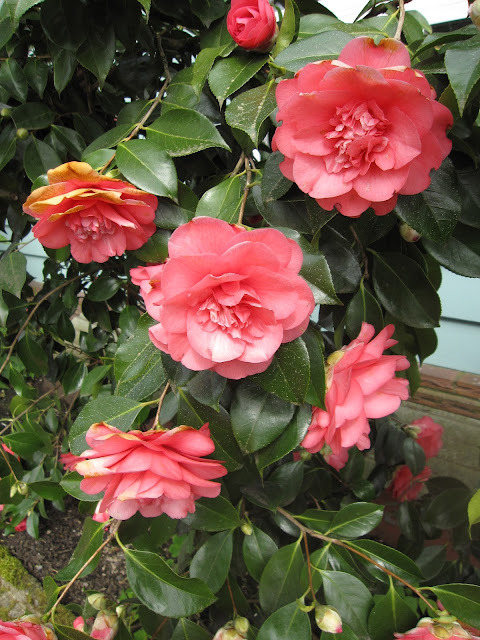 A glorious weekend has encouraged all of Portland outside, the better to enjoy Bloom Day. I have some old and some new blooms this month, but all of them are appreciating the warmer, slightly drier weather. Vaccinium ovatum, Evergreen Huckleberry, still blooming happily. 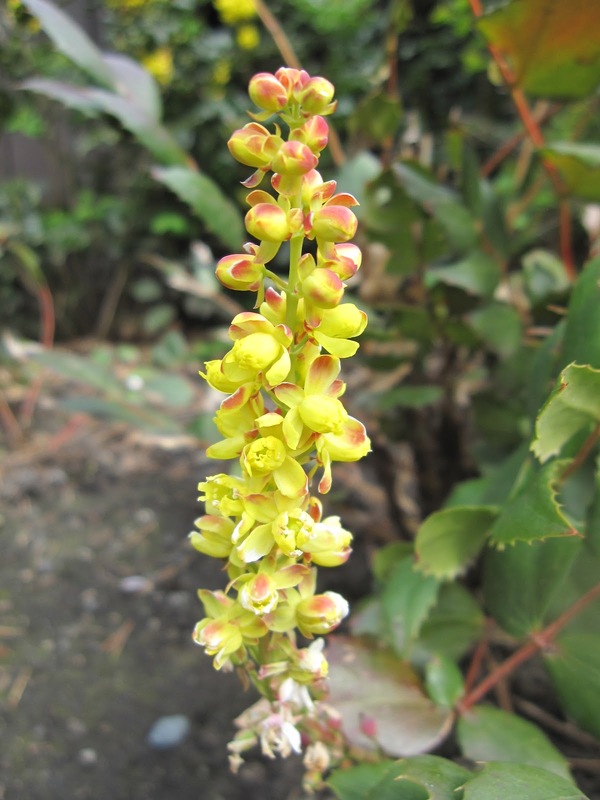 Mahonia aquifolium had just begun to bloom when I showed it for March Bloom Day. Now it's in full flower. 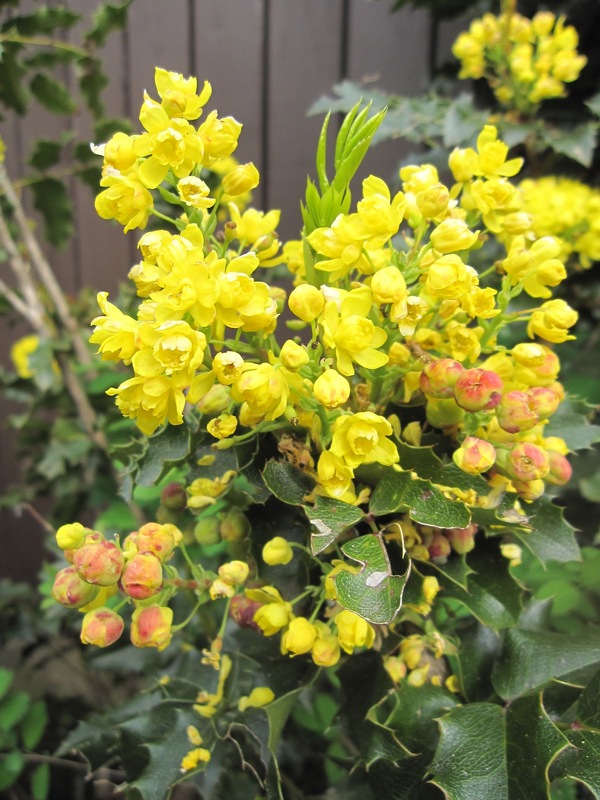 The smaller Mahonia nervosa has finally caught up with the blooming crowd. 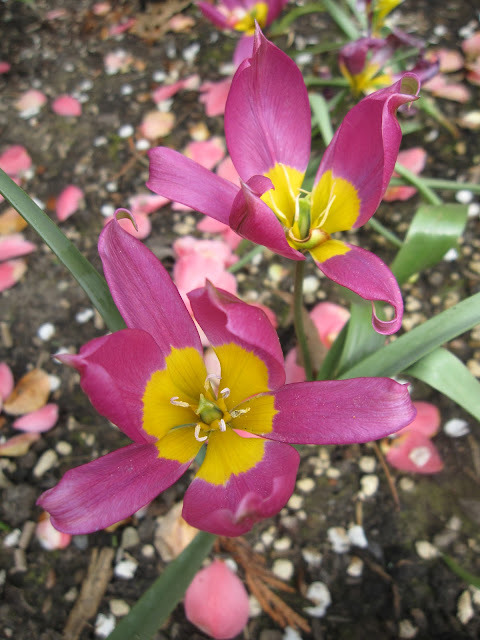 Tulipa 'Little Princess' surrounded by the spent petals of Camellia 'April Kiss' and the neighbor's ornamental pears. The last blooms from Daphne odora 'Marginata'. More pink in the form of Loropetalum chinense 'Sizzling Pink'. My lime-green NOID Kniphofia, is almost there. Ceanothus 'Victoria' has a few early blooms to tantalize the bees. 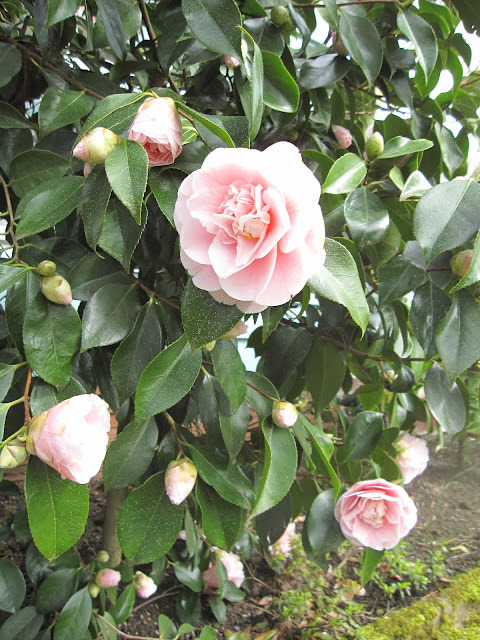 The two inherited camellias are in full bloom, though a little damaged by the rain. Oxalis oregana, a lovely Oregon native for shade. 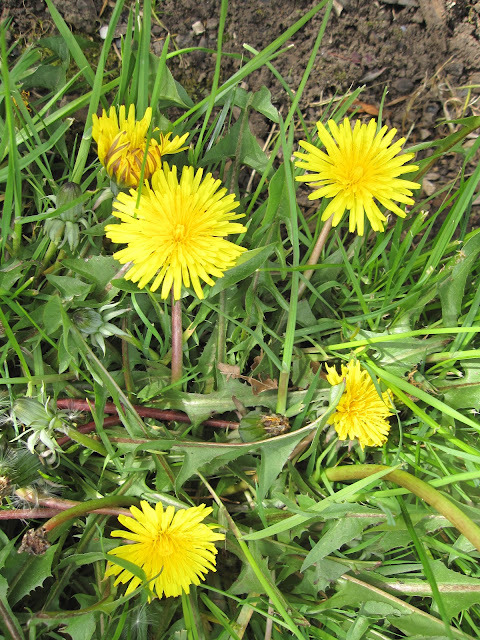 And what would spring be (at Longview Ranch, anyway) without some dandelions in the grass? They're yellow, they're fresh, and the bees love them. Visit Carol at May Dreams Gardens for more April blooms. Happy Bloom Day all! It's been an exciting month of plant-buying mania. In fact, over the past four weeks (and four shopping opportunities) I have come home with such a plethora of plants, I think the Mulch Man is considering an intervention. He might not have noticed quite as much if I'd had the opportunity to plant a few more of them, but Portland weather has not cooperated, so they are stacking up in a rather obvious way. My post-birthday trip to Cistus Nursery to spend a gift certificate resulted in two lovely additions to the agave collection, Agave bracteosa 'Calamar', and A. bracteosa 'Monterrey Frost' (both at 40% off during their sale!) I want to transition my big A. bracteosa into the ground this year, so the 'Calamar' is my "backup" plant in case the big one perishes. And who could resist 'Monterrey Frost' with its handsome, clean stripes? I also got a plant I've been looking for since last summer. 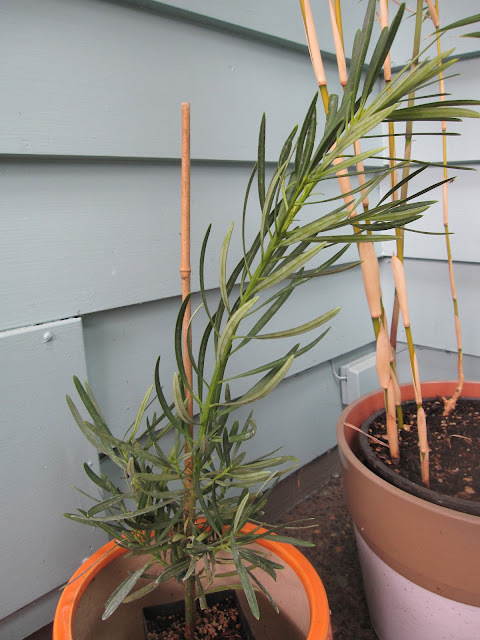 I had been dithering over whether to get Podocarpus macrophyllus or P. salignus for a pot on the new patio: we don't have room for both. 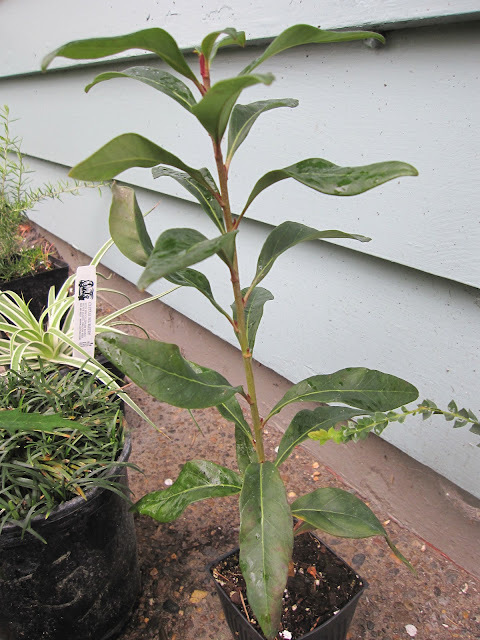 It just happened that Cistus had a cute adolescent Podocarpus macrophyllus so the die was cast. 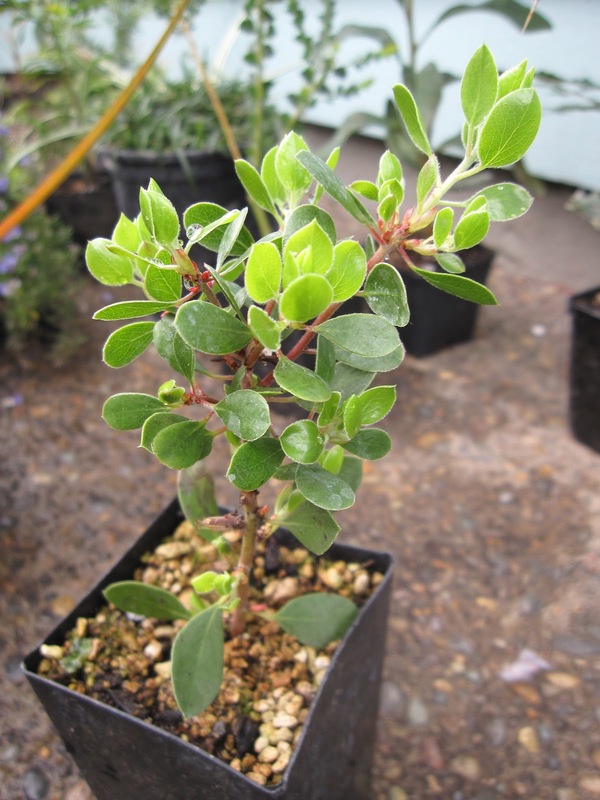 Last, I needed a small manzanita for my narrow parking strip. 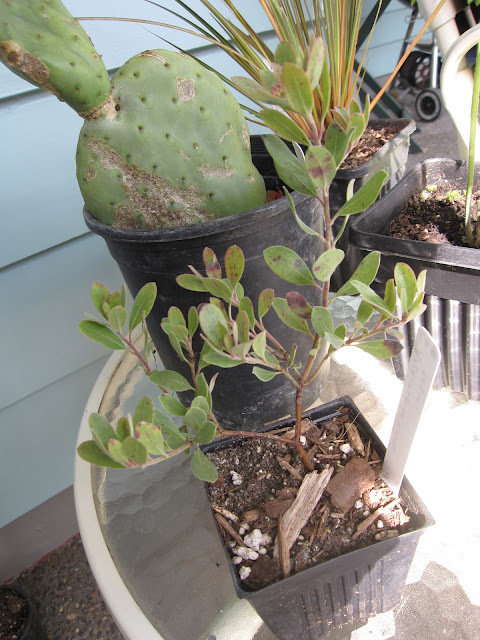 The world's littlest Arctostaphylos hookeri 'Green on Black' came home with me, and it's already putting on new growth. Next up was the Portland Yard, Garden and Patio Show, with its Green Marketplace. It was a modest but select group of vendors, including some of my favorites. 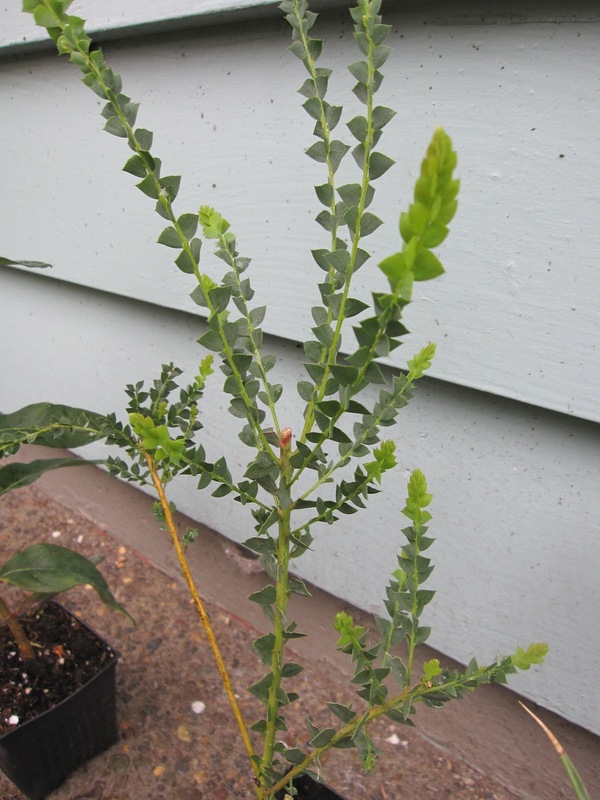 There I scored a sweet little Acacia pravissima, from River Rock Nursery. 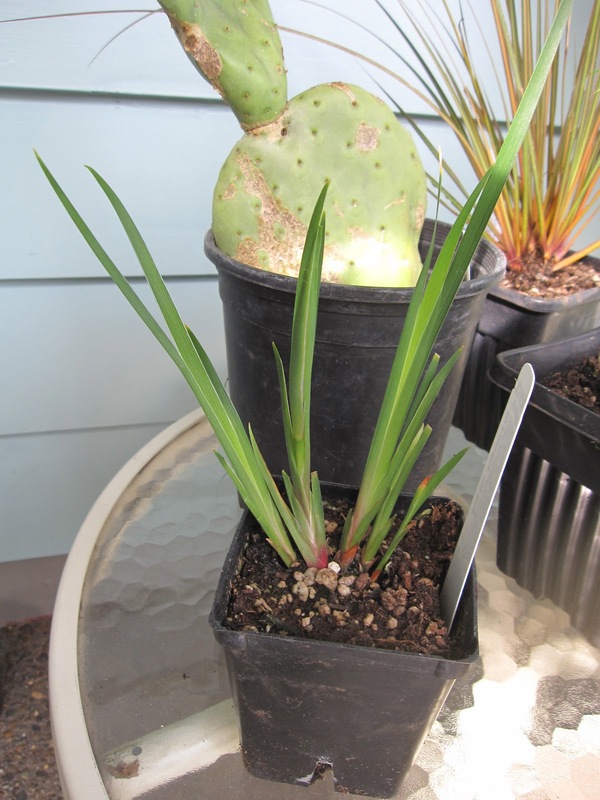 This one will live in pot for now, although it seems they grow so fast it might go into the ground next year. Also from River Rock Nursery, I got an Embothrium coccineum, a Chilean Fire Bush. It's small, but choice ("choice" is the euphemism for "expensive" I use with the Mulch Man.) I had better take excellent care of it. 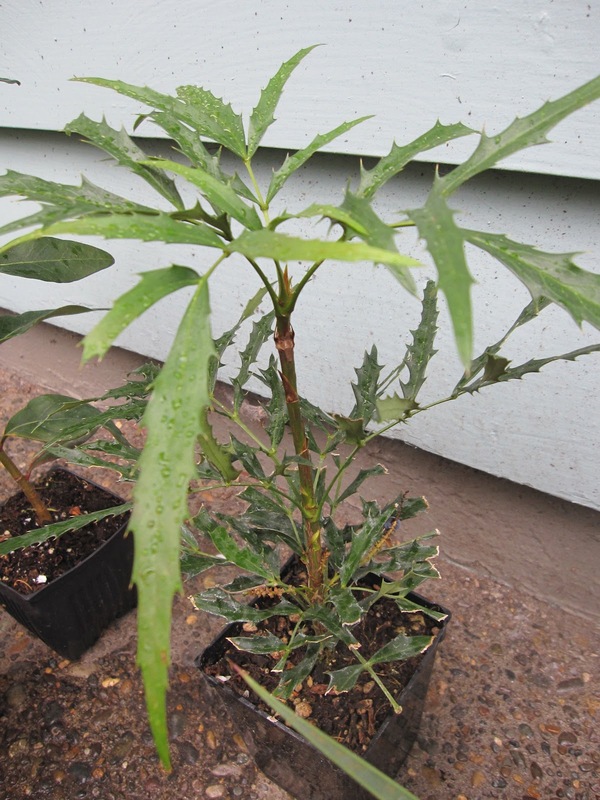 From the Xera table at the YGP, I selected Mahonia fortunei 'Dan Hinkley'. I love its delicate, narrow leaves. 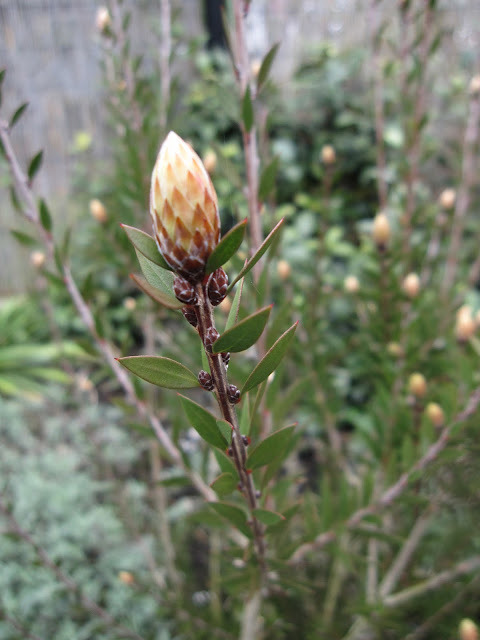 And because I dearly love it, and feel so bad about killing the first one, I bought another Grevillea juniperina 'Lava Cascade' from Xera. You saw it last month in my Bloom Day post, but lest you fail to appreciate its extraordinary blooms, here it is again. Two weekends ago in the freezing rain, I attended the annual plant sale at Lan Su (the Portland Chinese Garden), and of course, I found plenty to love. 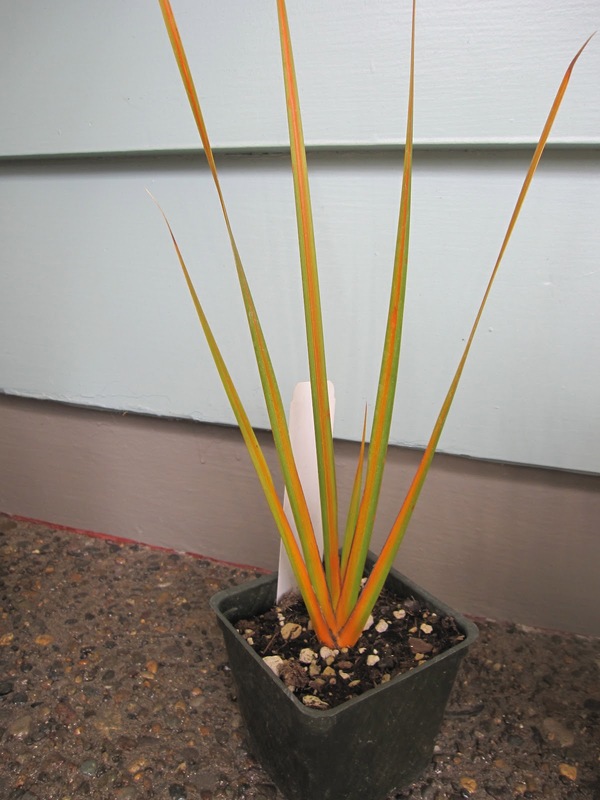 From Lan Su's own booth, I picked up a quart of Ophiopogon japonicus 'Nana', because one can't have too much mondo grass. This will divide nicely for a small area of ground cover. From Bloom River Gardens, I chose a small chartreuse Rhododendron 'Shamrock' for a shady spot. 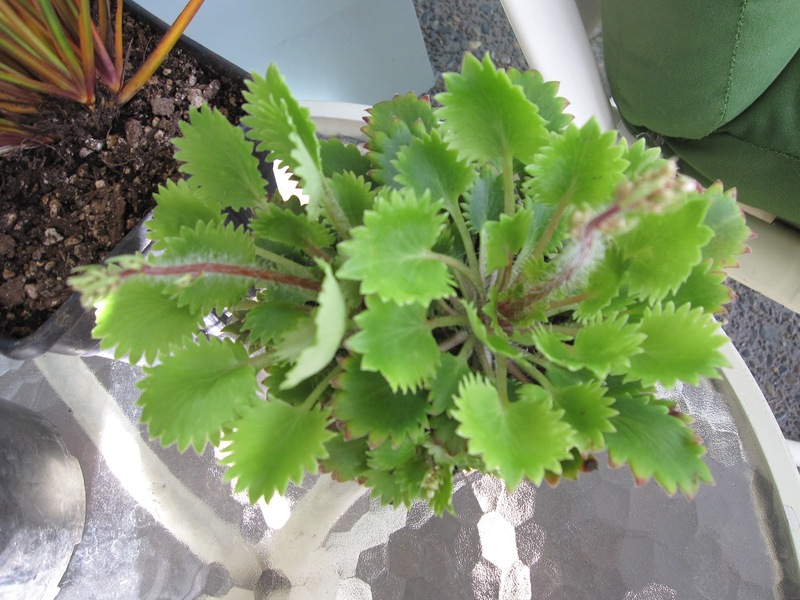 I picked up Saxifraga dentata (x geum) from Joy Creek Nursery. This is a plant I first discovered over four years ago and I'm only now getting around to having one of my own. I hope it spreads. 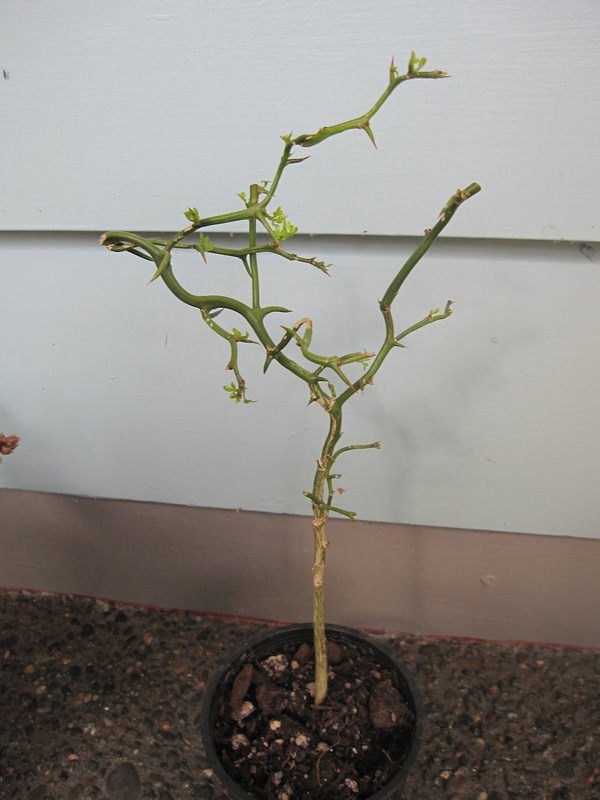 But of the four plants I brought home, my favorite is the young Ponciris trifoliata 'Flying Dragon', from River Rock Nursery. The larger ones were pretty spendy, so I settled for this awkward teen. I will just have to be patient as he gains stature and style over the years. Having just admired the big ones at McMenamin's Chapel Pub today, I have a line on how to guide his development. My most recent plant buying excursion was Hortlandia - the Hardy Plant Society's spring sale this past weekend. Even though I went after lunch, there was still so much to see - and buy! 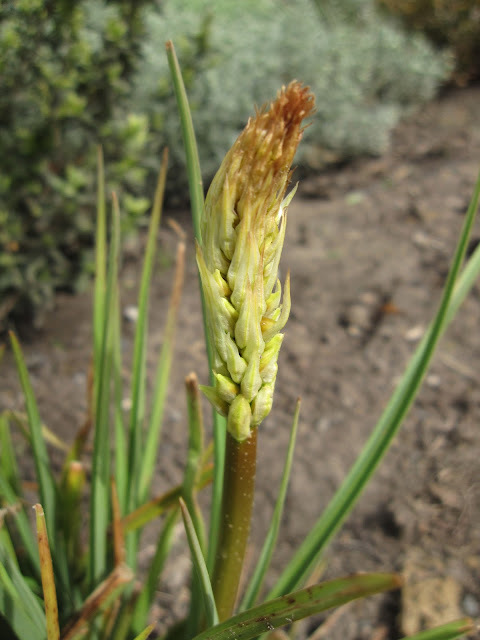 I was on the hunt for a few things: Libertia was one of them. I found Libertia ixiodes 'Taupo Blaze' at the Cistus table. Then at the Dancing Oaks Nursery table I found the Libertia I originally wanted, L. peregrinans 'Bronze Sword'. Back at the Cistus table, I spotted Ceanothus 'Joan Mirov', one of the small-leaved ceanothus I have always loved. Into the box it went. Feeling a little chagrined at the number of plants I had already acquired, I decided to buy the Mulch Man something from Cistus for the Northwest Territory. Iris x pacifica 'This Ring" was just the thing to deflect some attention from my purchases. It doesn't look like much now, but this native cultivar has "Large ruffled flowers with an interior of warm amber and edges picoteed in lavender." 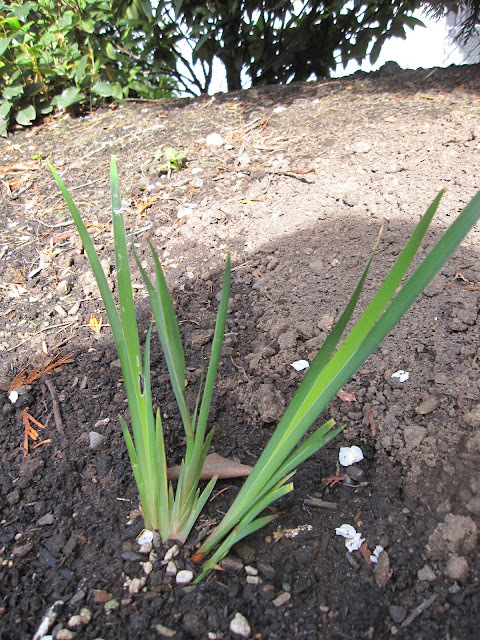 It's billed as one of the most spectacular Pacific Coast irises and it's already in the ground, so I hope the Mulch Man likes it. Loree at danger garden had alerted the locals to The Desert Northwest's participation in Hortlandia this year, so I went to meet Ian. From him, I acquired Arctostaphylos x media (Sequim), grown from cuttings made in a Sequim, Washington park, according to his catalog. Another plant on my radar to get at the sale was Syneilesis. I have a hybrid and I wanted more of this strange shade lover. I got S. aconitifolia (last one!) from Dancing Oaks Nursery and found another hybrid (probably S. aconitifolia x palmata) at Collectors Nursery. Here's a shot of them with their elder sister in my garden. From what I can tell, the hybrids (middle and right) look a little downier than the aconitifolia on the left. The last thing I picked up at the sale was from Trans Pacific Nursery. 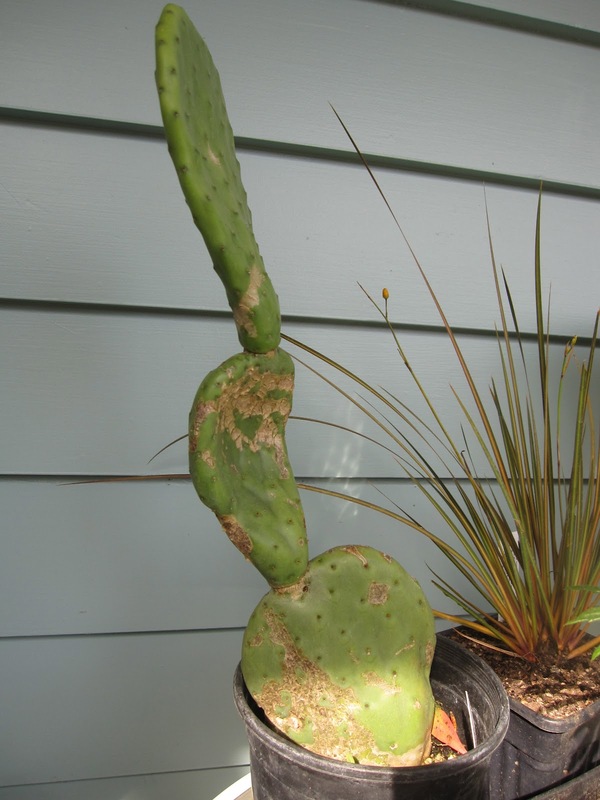 I love opuntias, but the Mulch Man is not a fan of all the spikes with their potential danger to cats and grandchildren. So how about Opuntia 'Burbank's Spineless'? I think this battled-scarred old veteran has such character, too. So there you have it: twenty plants in four shopping trips over about a month. In my defense, this is prime plant-buying season, and three of the four buys were once-a-year opportunities. I certainly expect to slow way down and concentrate on planting and tending this summer. I just call it my hobby.